For decades, scientists have tracked Lake Tahoe’s treasured water clarity by boating out to the middle of The Lake, dropping a white disk into its depths and measuring the distance at which it can no longer be seen. The Secchi disk has been the standard measure of The Lake’s clarity and health, but that point, somewhere out in the middle of the big alpine body of water, isn’t as meaningful to the average resident or visitor, scientists have argued recently. The nearshore, where most people sunbathe, swim and paddle, has accordingly become the center of scientific attention (as recently reported in Tahoe Quarterly’s 2014 Summer issue on the Desert Research Institute’s historical data gathering and planned jet boat designed to assess those conditions). Since then, UC Davis’s Tahoe Environmental Research Center (TERC) began implementing another plan for monitoring the nearshore, one not only promising data of unprecedented detail, but also leading the way in a unique public-private partnership to monitor and protect the Jewel of the Sierra. 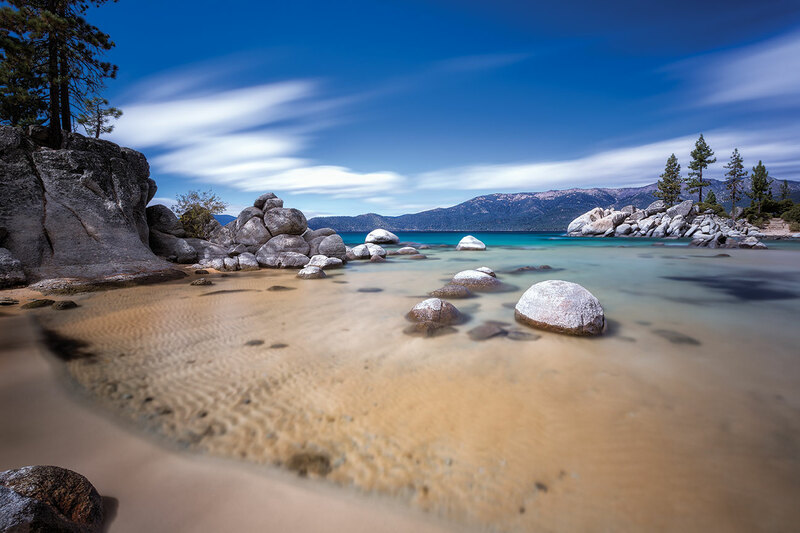 TERC partnered with six lakeside property owners—stretching from Rubicon Bay to Sand Harbor—to place real-time water quality monitors in the waters off their homes in August and September, says Geoffrey Schladow, director of the UC Davis research center. “We’ve always talked about Secchi disk measurements in the middle of The Lake, but there is very little known about the nearshore—what is water quality like in a good week, after a storm, how long does it take to recover after a storm?” Schladow says. He’d like 20 stations, spaced about every two to three miles around The Lake, in place by spring in time for runoff monitoring, Schladow says. Additionally, another monitor at Cascade Lake and, in a partnership with NASA, one in the middle of The Lake on a buoy, will be used for comparison. Tahoe Regional Planning Agency (TRPA) officials see potential value in the data. As for how it might affect policy, it’s too early to say. “We’ll have to see what the data shows and how it points the conversation,” Thayer says. Each monitor, about three feet by two feet by one foot, draws power from and sends data through a cable tethered to the shore, Schladow says. As algae can easily build up—and because many of the functions rely on light detection—a built-in wiper cleans the monitor every five minutes. Those factors include algal concentration, turbidity, dissolved organic matter, temperature, electrical conductivity and depth, which will aid in assessing how waves affect those measurements, Schladow says. Clarity is important on the shoreline, Schladow says, not only because that’s where most people interact with The Lake, but because it’s also proving to be a significant factor in invasive species habitability. Lake Tahoe’s famously clear waters allow a lot of UV radiation from the sun to penetrate, and recent studies have shown that native species, particularly in their early stages of life, are more able to withstand the UV rays than non-native species, Schladow says. So if clarity diminishes, invasive species are more able to survive the sun’s radiation. “The perfect example is Tahoe Keys: There are high levels of dissolved organic material and high turbidity, and it’s also the highest findings of invasive species,” Schladow says. The monitors are already turning up some interesting data regarding invasive species. The North Shore is more affected by waves than the West Shore, with algae in the sand getting stirred up, Schladow has noticed. “We aren’t seeing any trends yet, but we’re looking at the data and seeing a lot of unexpected things,” he says. The how of the program, with its unique public-private partnership, is arguably as interesting as the data. “We’re really excited about this as an example of a private contribution to science,” Thayer says. The idea to work with private citizens, businesses and groups came by considering who is most affected by changes in nearshore water quality—those who live and play on the shore, Schladow says. Each private partner is not only allowing the use of his or her property, but also paying for four years of operation—to the tune of $50,000, Schladow says. UC Davis covers operating costs while the manufacturer provides some funding, as well. He’d like the monitors to be in place for more than four years, Schladow says, but decided that was a good initial period of time, after which partners could reassess their involvement and TERC could decide whether 20 monitors were still necessary. The next step is to make the data available to the public. “We’d like to develop a website so the public can see the data online,” Schladow says. To partner with TERC to host a monitor, call (775) 881-7560 or go to terc.ucdavis.edu.